Eastbourne Borough striker Elliott Romain said confidence has been the key to his flying start to the season. 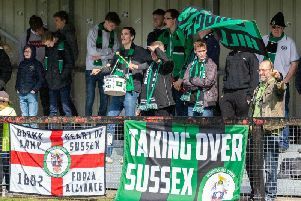 Romain, 24, has scored eight from 11 appearances so far this campaign and the former Lewes man is keen to reach the 20 goal target. His performances also attracted the Ladbrokes cameras to Priory Lane for The Sports’ FA Cup clash with Met Police. Betting company Ladbrokes are seeking the ‘new Jamie Vardy’ and they visit non-league clubs with in-form strikers who could potentially step-up and forge a career in the top flight. Romain said, “I knew nothing about it until they interviewed me after the match. It’s great that people have looked at my goals. Obviously I would love to play at the highest level I can. The improvement has been there for all to see. Romain was signed by Borough manager Tommy Widdrington from Lewes two seasons ago. He was used sparingly last campaign as he adapted to life at a higher level but this year Romain was eager to take his chance. “I just wanted to show what I could do. I knew the manager was signing JT (Jamie Taylor) and Nat (Pinney). I spoke to the gaffer (Tommy Widdrington) and he told me I was an important part of his plans this season. “I have stepped up the levels before and it has always taken me a little while to find my feet. Then something clicks, I realise I can play (in a higher division) and I become more confident and feel more part of the team. Romain has worked hard on his game. During his youth career he represented Millwall and Brighton before joining County League one side Three Bridges. As a fiery young forward he became a regular in the Three Bridges side and enjoyed his best campaign when he struck more than 20 goals and helped them into the Ryman South. His career though almost came to an end in 2011 when he was involved in a terrifying car crash. Aged 19, he was driving home from his part-time job at Tesco Express and his car flipped as he swerved to avoid a car that pulled out in front of him. Upside-down, Romain had to crawl from the wreckage and he admitted he was lucky to be alive. The roof on the passenger side of the car was completely crushed. But the driver’s side remained intact, allowing Romain to escape with cuts and bruises. At the time Romain said, “I feel a lot more determined to go out there and play well after what happened. It could have ended my career. That determination saw him progress to the Ryman Premier with Lewes where he was signed by their former manager Garry Wilson after impressing at a trial. His talent was rarely an issue but regular bookings and a few red cards raised question marks over his temperament. “It is something I have had to work on,” admitted Romain. “I have always had that edge to my game and growing up I was always the most competitive player in the team. “In the County League I was often booked because the referees didn’t see what the defenders did to me. I’ve been headbutted and kicked to bits and I would retaliate. Borough enjoyed FA Cup progress against the Met Police last week and he hopes a decent cup run can create a buzz that will in-turn help inspire their push for the play-offs. “It was all about the result. We weren’t at our best but Gav (Gavin McCallum) and Nat (Pinney) popped up with the goals. It was a typical cup match, really tight. As for his personal targets - can he be the new Vardy? “I don’t know, I just want to keep scoring,” He said.